Pangoro in game: 695 Who? Important notice! 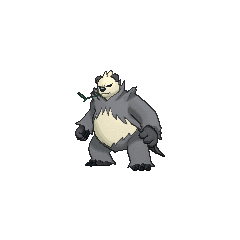 Pokemon Pangoro is a fictional character of humans. Pangoro (Japanese: ???? Goronda) is a dual-type Fighting/Dark Pokémon introduced in Generation VI. 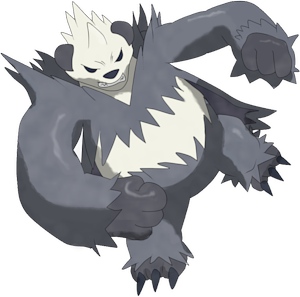 Pangoro is a large bipedal Pokémon, resembling a humanoid panda bear. It has a stocky build with a round belly, short legs and long arms with large paws, which are often balled into fists. Its head and belly are covered in thick white fur, while its lower body, chest, arms, and back are covered in equally thick but dark grey fur. A long fringe of this dark grey fur hangs down behind its back that, in combination with the rest of the dark-furred pattern, gives the impression that Pangoro is wearing a longcoat and trousers. 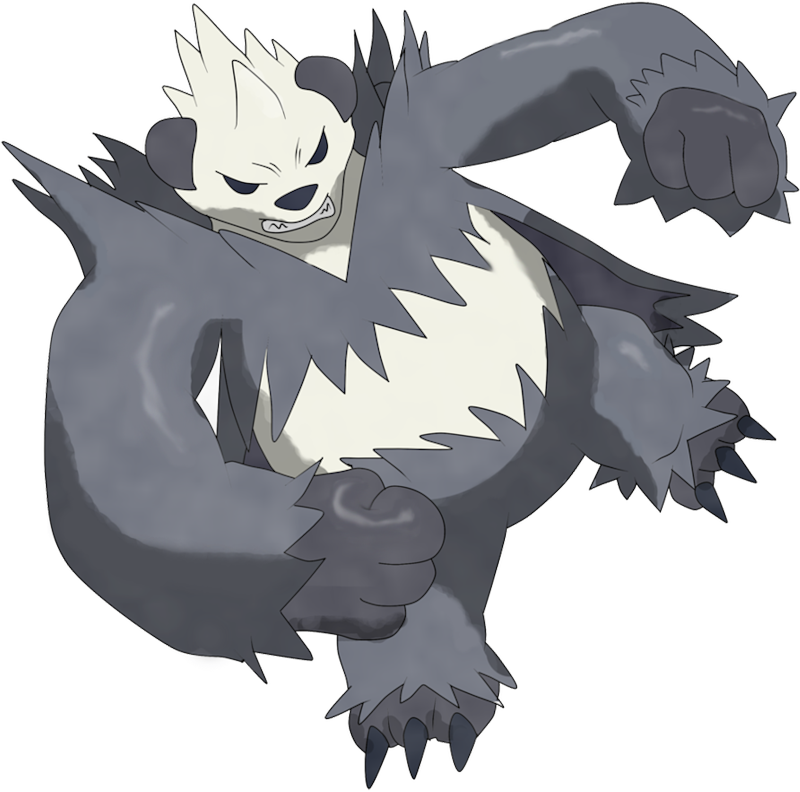 Pangoro's three-fingered paws have shorter fur a darker shade of grey than the overcoat and are tipped with vicious black claws. Its face tapers down to a snout and its white color contrasts with its black ears and nose as well as the two semi-circles of black fur under its brow that render Pangoro's eyes indistinguishable. 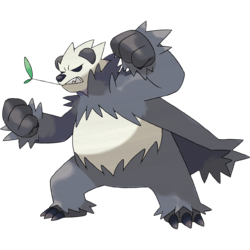 Pangoro likes to carry a thin leaved shoot in its mouth, which has prominent lower fangs. 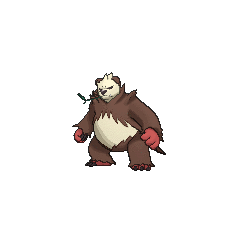 A Pangoro appeared in The Bamboozling Forest!. A Pangoro appeared in Diancie — Princess of the Diamond Domain. Three Pangoro appeared in So You're Having a Bad Day!. A Pangoro appeared in Rotom's Wish!, under the ownership of a nameless Trainer where it was defeated by Mantle's Krookodile. Serena's Pancham appeared as a Pangoro in a dream in Dream a Little Dream from Me!. Pangoro made its debut appearance in Kalos, Where Dreams and Adventures Begin!. 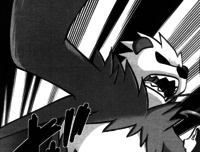 A Pangoro appeared in A Conspiracy to Conquer!, in which it was being possessed by an evil, psychopathic Malamar. A picture of a Pangoro appeared in Battling Into the Hall of Fame!. In the X & Y chapter, the Lumiose Press editor-in-chief used a Pangoro and two Spewpa to try and kill Alexa in order to prevent her from giving information about the destruction of Vaniville Town to the public. Alexa was saved by X, who battled the editor-in-chief and defeated him. Increases damage done by any Fighting types in a combo. Pangoro is based on a giant panda. 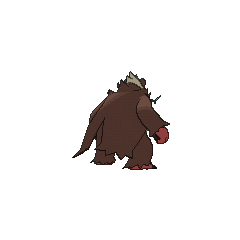 Considering how its pre-evolution needs to be around Dark-type Pokémon as a prerequisite for its evolution, its hot-blooded, belligerent, yet virtuous attitude, and features such as a coat-like cape and chewing stick, Pangoro also appears to draw inspiration from bancho, Japanese juvenile-delinquent leaders. The method of evolution may imply that the pure Fighting-type Pancham acquired its Dark type after evolution due to being led astray by a "bad influence". Its Shiny coloration could be a reference to the Qinling panda, whose coloring tends to be more brown than black. Pangoro and Goronda may be a combination of ???? gorotsuki (rogue), ???? gorogoro (rumbling sound), and panda. Korean ??? Buranda From ??? burangja, ??? bulyangbae and panda. It is also a play on ??? bulhandang.